On other days they seem to make it their mission in life to shred our toilet paper, puke on our most prized possessions and potty in whatever house plant appears to be your favourite. 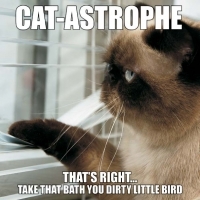 Cat-astrophe features sassy memes of these fluffy pranksters, caught in the most hilarious, most shameful and all-too-well-known feline misdeeds, clearly enacted with little to no remorse. Cat lovers everywhere will identify with and giggle through the frustrations of the day as this hilarious book reminds us that unconditional love goes both ways. On good days, cats are known for their poise, discerning tastes and impeccable personal hygiene.